Japanese peanuts, called “cacahuates japoneses” in Mexico where the snack originated, have crossed the border to entice fans worldwide with their savory—and sometimes spicy—allure. The product’s name stems from a blend of its creator’s heritage and his location. A Japanese immigrant living in Mexico City invented this nutty confection in the late 1940s, first selling them in La Merced Market. He enrobed a peanut in a crunchy, thin shell made of wheat flour mixed with a bit of soy sauce. Japanese peanut fans in Mexico usually sprinkle the nuts with chili powder and/or fresh lime juice before eating. While the traditional product relies on wheat flour for the outer coating, other varieties of flour such as rice are sometimes used. Lately, developers have added more and varied spice blends to the dough coating to give the product a bit of a kick. The dough covering was applied to the peanuts manually for years, until 10 years ago when AC Horn Manufacturing developed one of the first continuous lines for automatic production. The company has since sold multiple lines into Mexico and Latin America. After its initial application, the dough coating on the peanut is relatively soft. If the product is processed using a conveyor belt, the dough flattens the round shape of the product. To preserve the round shape, Horn equipment uses a rotary heating device instead of a belted oven where the product is static as it moves through the heating zone. A rotary dryer keeps the product tumbling and moving as it is being heated. 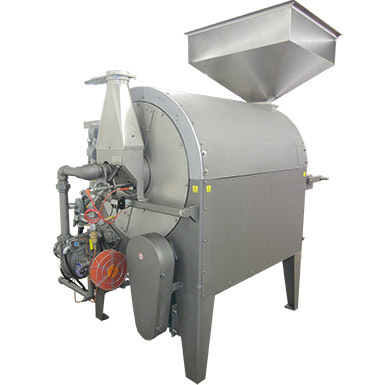 AC Horn Manufacturing offers the only rotary oven specifically designed to roast dough-coated Japanese-style peanuts. Our proven design is based on the Manley poppers and puffers, which set the industry standard for these machine styles. Also capable of roasting other nuts and seeds, the Japanese Peanut Rotary Oven is available in three sizes. The proprietary lifting paddles are key to proper dough-coated peanut processing. Dough coated products tend to stick together. This can cause them to break after roasting, or result in lack of uniformity. Our lifting paddles slowly separate the product as it passes through the heat zone. As the drum rotates, the peanuts are lifted and rolled within the product bed for a perfectly coated nut every time. In addition, a high-efficiency forced air premix combustion system precisely mixes the air and gas in order to maximize fuel efficiency and minimize gas consumption. Programmable digital temperature control minimizes the potential for burnt product and maximizes energy efficiency. A variety of hopper feeder/combinations are available for use with a variety of product types. 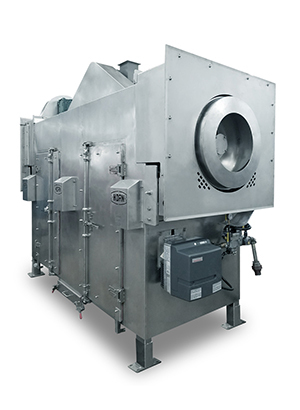 AC Horn Manufacturing designed the equipment in modular format, to enable this type of rotary oven to connect two or more heating zones together. This allows the processor to link different temperature zones and airflows or processes together to run consecutively, expanding its use beyond that of a single Rotary Oven. For example, certain types of products such as sunflowers might be brined or wetted to infuse the seed kernel with flavor inside the shell. 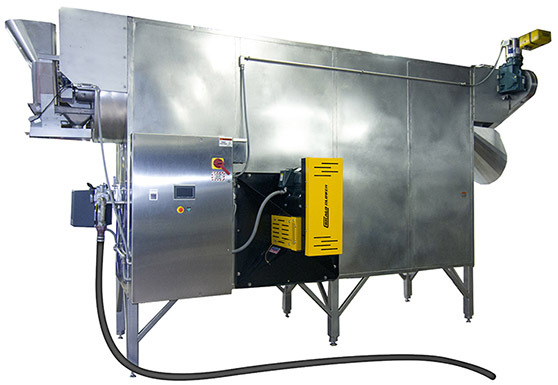 This type of product will use a drying step to shed the excess moisture followed by a higher-heat roasting step to finish the process, lending itself to a modular rotary drying system. In many cases, the moisture removal process creates the need for a sanitary wash down construction. Thus the standard Rotary Oven includes continuously welded stainless steel heat zones, full-length access doors and built-in floor drains. And while the standard design has built up a proven track record, these units are often customized to provide the specific features which most benefit a customer’s process.